I chose to use two different types of armatures for this film. The hero has a ball and socket armature, made from a kit manufactured by Julian Clark. More details on the kit here. 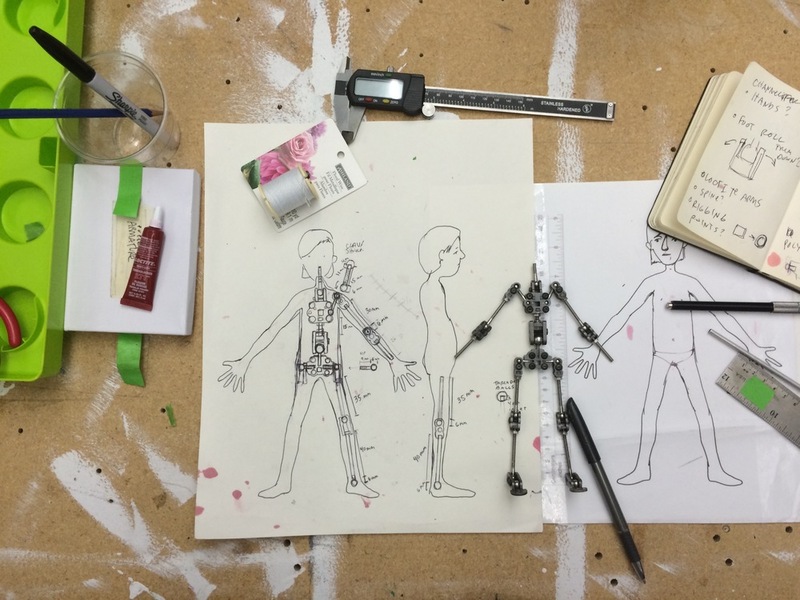 SCAD’s stop motion program encourages and teaches the basic wire armature method for the purposes of speed and cost efficiency. It discourages students from using ball and socket armatures. This is great for getting a quick puppet for animation, but I wanted to learn how the advanced ball and socket armatures work and see the differences in feel and most importantly, performance. All of the animators on the film are really excited to animate a puppet with a ball and socket armature for the first time! The kit came in parts and I fit the kit to the character’s proportions, and also made a few adaptations of my own. The kit was a great learning experience, but there are definite structural changes that would improve it's functionality. The spine only has one large ball joint instead of two smaller ones, and the joints (which are laser cut steel) are a bit bulky as well. I'd love to be able to mill my own sockets and joints, but SCAD's facilities are limited and my production schedule won't allow it for this film. The hand armature was too bulky and didn’t suit my character design. To solve this problem, I tapped brass channel with an M3 tap and made a removable forearm. The wire hand armature fits right inside and can be replaced when it breaks. The hand is formed using 32 gauge white floral wire. Dad, Kid, Mom jigs for hand armature wire. The kit comes with hinged feet, but there was no way to tie them down. I used silver solder to braze two nuts to the steel plates. The rigging points in the back and hips are made of K & S brass channel and offer two options for a fly rig. The puppet is show wrapped in PTFE thread seal tape and fitted to the mold. The tape prevents silicone from filling the joints when it is cast. This photo will serve as a reference guide for mapping the tensioning points on the joints once they are hidden in silicone. I’ll print out a 1:1 copy and use it to access the tension screws. To prevent touchdowns, where the wire is seen through the silicone, I’ll be painting some silicone on the hands and other parts of the armature just to be safe. The shoes are sculpted into this puppet and they will also be painted in with a tinted silicone for detail.